Killearn is a village and parish of approximately 2,500 souls nestled under the Campsie Fells in West Central Scotland. We live right on the Highland Line and boast the most southerly Highland Malt Distillery in Scotland at Dumgoyne. From 1889 to 1893 Excise Officer Tedder worked at the distillery and his son, the late Air Marshall Lord Tedder, was born in the Customs House (which is now a rose garden). His son became Professor of Chemistry at St. Andrews University. Both The West Highland Way and the John Muir Way pass through the parish but the standard routes bypass the village by about a kilometre. Access from the routes to the village is via Drumbeg Loan or Station Road. As our local song writer famously wrote we have "four churches, three tennis courts, two public houses and a Spar!". Sadly we have lost the Spar and one of our public houses, the Killearn Hotel, stands empty awaiting a new tenant. Our main link to the rest of the world is the car but there are bus services from Glasgow and Stirling. Timetables are available on the "Transport" page on the site. In connection with the centenary of the outbreak of World War 1, research is being carried out into the Killearn casualties of the conflict who are listed on our War Memorial. Any information would be gratefully received. See "Casualties of War" on the "All Killearn Archive" page for more information. Bookmark the site and visit us regularly! 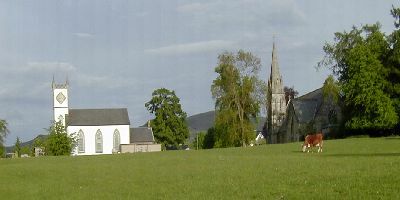 Two of our four churches with the Glebe in the foreground and the Campsie Fells in the background before the addition of the new Kirk Halls and the 2013 refurbishment of the Village Hall. We think our Glebe has the best view of any in Scotland. Click here to see the view! The Glebe is owned by a local charity called The Killearn Trust. The two churches after addition of the new Kirk Halls (right) and the 2013 refurbishment of the Village Hall (left). 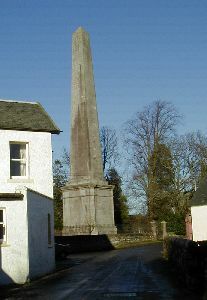 The Buchanan Monument in the centre of the Village with a corner of the Killearn Hotel (formerly the Black Bull Hotel). The Buchanan Monument was erected in 1788 by private subscription. It commemorates George Buchanan (born 1506 died 1582) who was a great scholar and tutor to James VI of Scotland (and I of England). George Buchanan was born at The Moss in Killearn and started his education in the village before studying in St. Andrews and Paris. Buchanan's quincentenary was celebrated in September 2006. Events included a walk in Buchanan's footsteps, a ceilidh, a concert, a commemorative church service, afternoon tea at The Moss and the planting of a memorial tree and a time capsule. Since then the monument and surrounds have been refurbished and two new descriptive plaques have been installed. "The Parish of Killearn, The Village and its History"
A new book edited by Fiona Glass, was published in March 2009. This is the second revision of the book which was first published in 1972. It tells the story of Killearn up to 2008. £20. A book of matched pairs of photographs of Killearn. Each pair comprises an historic scene and a photograph showing the same scene in 2006. £4. A life history of George Buchanan written by Catherine Organ. £7.99. These may be obtained from shops in Killearn, local libraries in the area, or by order through any bookseller.